When school cafeterias serve meals that include popular vegetables, kids are less likely to drop their food in the garbage, according to a study led by a team of Texas A&M University System researchers. The team measured food waste in three elementary schools in Bryan and Dallas that participate in the U.S. Department of Agriculture National School Lunch Program. “Our research team looked at whether there is a relationship between consumption of certain entrees and vegetables that would lead to plate waste,” Texas A&M AgriLife Research economist Oral Capps Jr. said. “We found that popular entrees, such as burgers and chicken nuggets, contributed to greater waste of less popular vegetables,” Capps said. 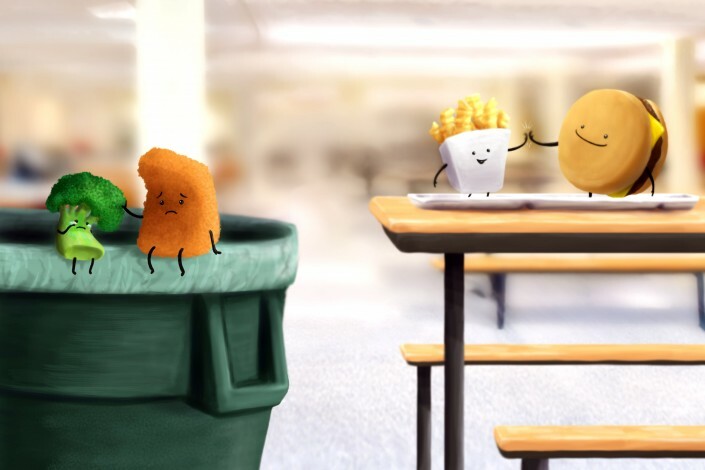 Conversely, entrees paired with potatoes – served as tator tots, oven-baked French fries, and wedges – experienced the least amount of overall waste, Capps said. Texas A&M students gathered the data by collecting trays containing leftover portions. Leftovers were separated in waste bags and each bag was weighed on a scale to measure the waste. The study was funded by the Alliance for Potato Research and Education and is published in the journal, Food and Nutrition Sciences. Texas A&M AgriLife Research led the research with the Institute for Obesity Research and Program Evaluation at Texas A&M University. Joining Capps on the research team was Peter Murano, associate professor from the Department of Nutrition and Food Science, as well as founder and former director of the Institute for Obesity Research and Program Evaluation at Texas A&M; Ariun Ishdorj, assistant professor in the Department of Agricultural Economics; and Maureen Storey, president and CEO of the Alliance for Potato Research and Education in McLean, Va.